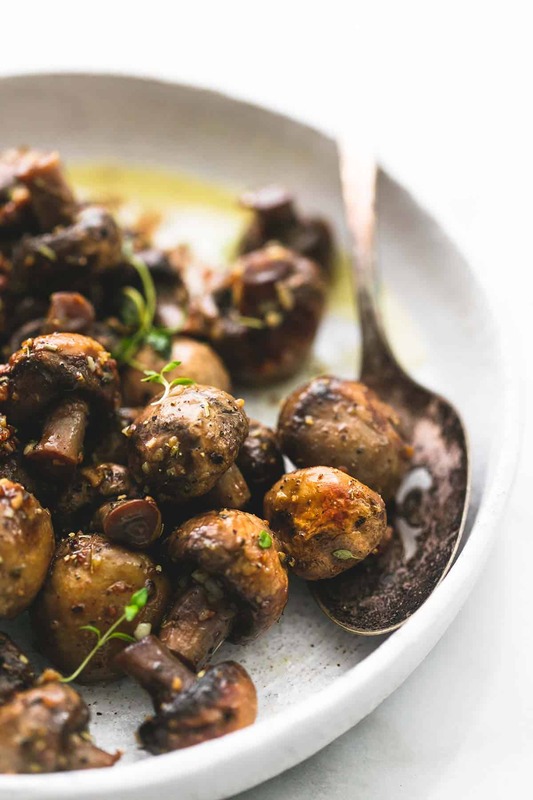 Quick and easy 15-minute sautéed garlic butter mushrooms are bursting with flavor and make the perfect side dish or appetizer for any dinner recipe. Need more sides to accompany your delicious dinners. Look no further than Roasted Brussels Sprouts with Parmesan and Balsamic, Loaded Baked Potato Foil Packs, and Roasted Lemon Garlic Broccoli & Cauliflower. Three words for you: GARLIC. BUTTER. MUSHROOMS. the end. 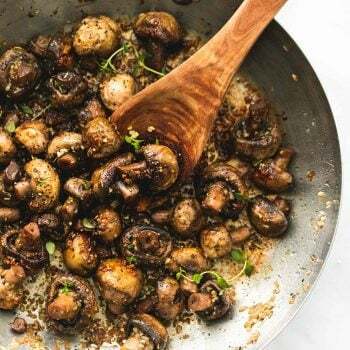 All you need is 15 minutes and I will teach you how to fix the easiest, tastiest mushrooms to go with any favorite meal. And being that it is the holiday season, these are especially perfect for holiday meals. 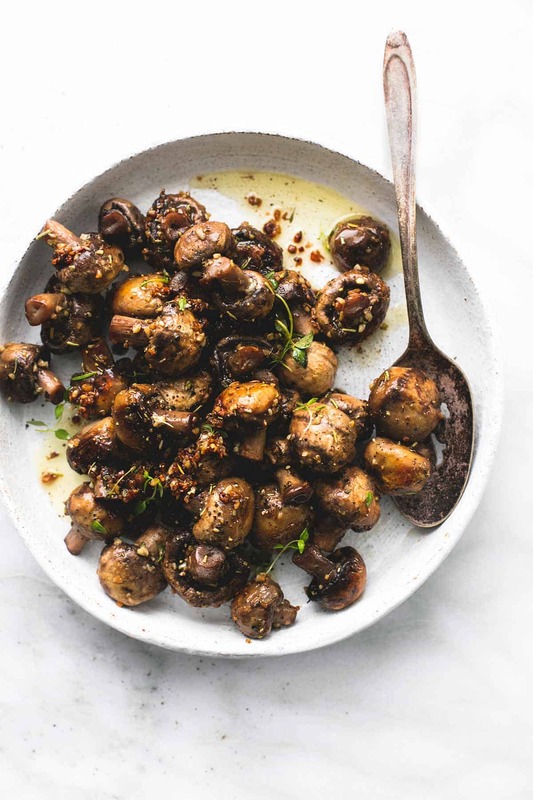 It’s easy to double or even triple this recipe for a crowd and they are so incredibly delicious, even mushroom-haters go crazy for these sautéed garlic butter mushrooms. 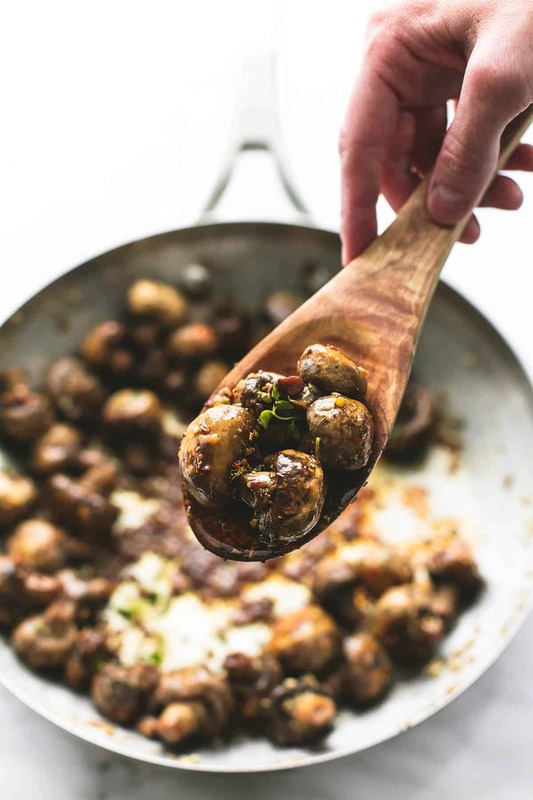 I’ve partnered with Anolon cookware to reinvent a favorite holiday dish this season and as soon as I got my hands on this beautiful Nouvelle Copper Stainless Steel French Skillet, I instantly thought of these garlic butter mushrooms. I’ve made them before, many many times in fact, but I wanted to put a twist on this old favorite and this year I’ve been a little bit obsessed with adding fresh thyme and other herbs to my recipes. That toasty garlic and browned butter sauce is very rich and incredibly flavorful, so adding fresh herbs really elevates this whole dish and gives it that mmph. That little extra something that only takes 10 seconds to add but is really a game changer. That toasty garlic and browned butter sauce is very rich and incredibly flavorful, so adding fresh herbs really elevates this whole dish and gives it that mmph. That little extra something that only takes 10 seconds to add but is really a game changer! I tested out this recipe in my Anolon skillet and it came out perfectly. With just the butter in the recipe, the mushrooms didn’t stick to the pan at all. The mushrooms came out perfectly browned and tender and soaked up that buttery garlic flavor even better than they did in my old battered pan. Side note: I didn’t even bother using a traditional serving dish for these mushrooms – just served them right out of the pan because it’s so pretty! Add butter and garlic to a large pan. Melt butter over medium heat. 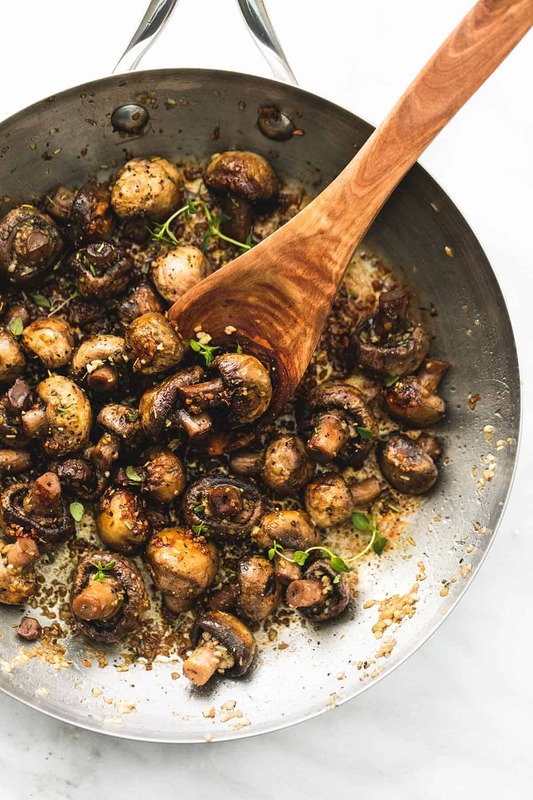 Stir in mushrooms and herbs (or Italian seasoning). 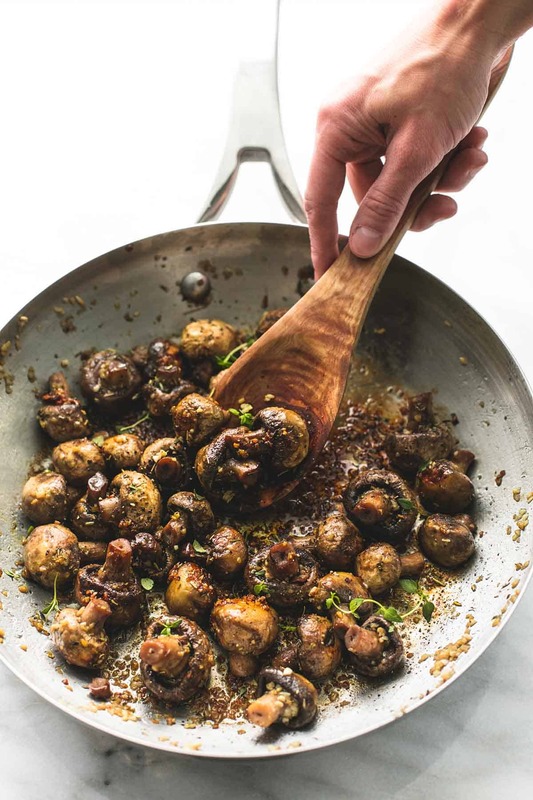 Saute over medium heat 5-7 minutes until garlic is fragrant and mushrooms are browned and very tender. Season with salt and pepper to taste (if you used salted butter you may not need any extra salt, just give it a taste and see) and top with additional herbs if desired. Serve immediately. This recipe post is in partnership with Anolon. You can find a wide range of Anolon cookware, bakeware, teakettles, cast iron, and cutlery online at Anolon.com or at Macy’s, Bed Bath & Beyond, and Dillard’s national retailers. Be sure to enter Anolon’s “Holiday Hosting” sweepstakes on Facebook! Mmmmmmm. Nothing better than butter mushrooms! I love to add a little more than a dash of cooking sherry too! Very yummy!!! Very yummy! … and simple. The fresh thyme gives a more complex flavor. I added a little Trader Joe’s Garlic Salt at the end. This can be used as a base for a number of dishes: add kale, add potatoes etc. I am a huge fan of mushroom as well! 😉 I hope that you love this recipe, David!